' Book Review: Heaven Is Here - Sisters, What! My sister-in-law recommended this book to me over a year ago and I finally got around to reading it this last month. I wish I would have read it sooner because it touched me deeply. I don't cry when I read books, but this booked made me tear up multiple times. Some of you may even know who Stephanie Nielson is. She is a pretty big blogger with an amazing story. You can follow her here. 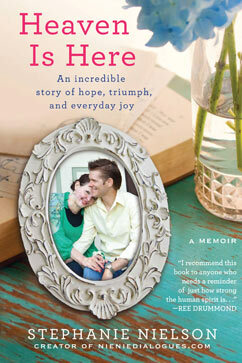 Stephanie and her Husband were in a airplane accident and this book is the story of their recovery. It is a story that gives you strength to push forward in your life no matter what your trial is. It helps you take a good hard look at your life and realize how many blessings you have. I would recommend this book to anyone, whether they are a reader or not. This was actually the first book I've been able to get through in months due to my chronic migraines and let me tell you, I got through it fast. It gave me the motivation I needed to start moving forward and pushing through the daily pain. But don't take my word for it. Read it. You will cry, laugh and find a strong desire to love more deeply.